Showcase Recital – Thursday, April 28, 6:00 pm Jubilee Auditorium. The annual student show celebrates the artistic accomplishments of Seton Hall students working a in a variety of media and subject matter. 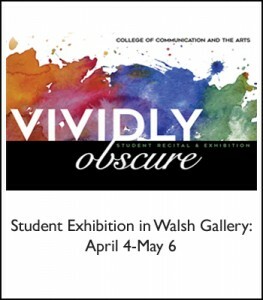 Organized by Courtney Starrett, Assistant Professor of Fine and Digital Art, and Assistant Professor Christine Krus of the Department of Communication and the Arts.